Happy Wednesday!! We can get so “me” focused sometimes. Let’s take a moment to encourage someone else today. That person sitting next to you. The person helping you at the store. The amazing people who work at your gym. Your family. Your friends. Everyone needs it…give it away and we bet you’ll be encouraged too!! Here’s more of the “Encouraging Words” series. Here’s another Encouraging Words video (the first one was about FAITH). This one deals with REST. It’s so easy to sidestep it and sacrifice it to things that seem more important…but that’s not a good recipe! We need it. Take it. Drink it in. It will make your workouts, your eating, your relationships, and just about every other area of your life better and more healthy. Here’s a link to the YouTube playlist for the Encouraging Words series. Hi Lovelies!! We hope you are having a marvelous day. That your journey has moved forward and you’re seeing progress. But we’re not crazy enough to think that some of you have not had bad days. Maybe you’re a part of our DietBet game and you did great days 1 and 2 only to blow it on day 3. Maybe you’ve been doing well with your weight loss for a long time and you’re really at a plateau. It’s OK! Make your next food/fitness choice a better one. Even if you don’t feel like it. Today we’re starting a new series. We’ll choose a word and give it a day. We’ll give you a short reason why we think it’s important and then we want to hear from YOU. Today’s word: FAITH. Faith in the process, faith in the plan, faith in yourself, faith in God. Faith that in the end you will overcome and you will reach your goal! We have to believe if we want to see results. So, here are our thoughts on faith…what are yours? I did it! I DID IT!!! Woooohoooo! Ok, I just had to get that out of my system. 🙂 As you all know I have had major butterflies leading up to the big race. I went through the training program…had the usual ups & downs, and the morning of the race I will admit I was down right scared! I know it sounds really silly, but there are still times where my inner “overweight girl” tells me I won’t be able to do it. Thank goodness I had Fitness Magazine’s very own Jenna Autori there cheering me on. She literally looked at me and said, “Don’t worry, you totally got this!” Sometimes a simple encouraging word is all you need to give you that little push! By the time I got to the starting line I was ready to attack this challenge! My game plan was to really pace myself and keep a consistent pace the entire race. So many people told me that I would want to book it in the beginning because of the excitement & adrenaline. Boy, we’re they right…I wanted to SPRINT in the beginning…the excitement from the crowd & the runners was electric! Despite my desire to break the world record…I started off with a pace that I knew I could sustain. I felt very strong for the first 7 miles…they seemed to fly by. Around mile 8 I hit my first “wall”. I was so thankful that I programmed some funny music on my playlist because right when I needed a boost RuPaul’s “Covergirl” came through my headphones! It really made me laugh and I will tell you it really was the boost I needed. I will tell you that I had multiple times throughout the race that I was VERY emotional. It was a little over a year ago that I was 261 lbs, unhealthy, & very unhappy. 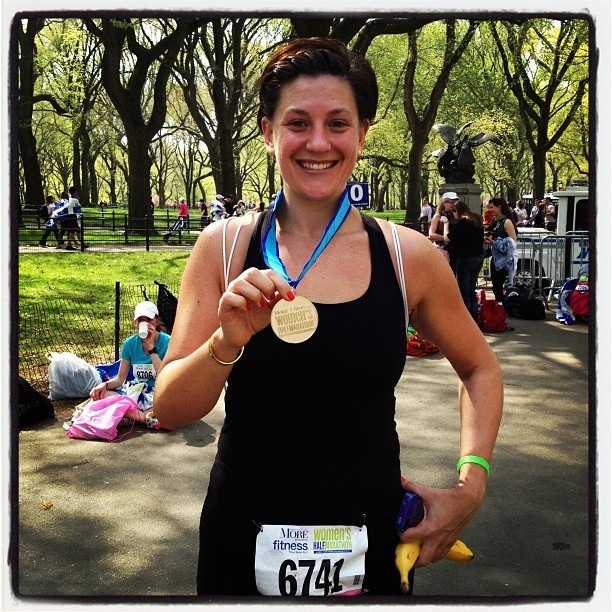 Fast forward & I am running…RUNNING…a half marathon. THIS is what life is about! I have never been so proud of myself. To be honest I don’t really even remember miles 11-13…I was so fixated on finishing! As I crossed the finish line I fell into a huge puddle of tears…I did it…and I ran EVERY step. It was just another moment in my life where I was overwhelmed with thankfulness. The Biggest Loser not only helped me lose weight, but they introduced me to my inner athlete. I’ll tell you…she is pretty cool. I am so thankful to Fitness Magazine. I can’t tell you how amazing the entire staff is! They truly care about people & helping us all become well rounded healthy individuals. I am thrilled to have had this experience & the opportunity to share my journey with their readers. I look forward to partnering with Fitness Magazine again in the future!